TPO’s 13th season concludes with one of the most popular works for choir and orchestra, Orff’s Carmina Burana. Join TPO Honorary Founding Chief Conductor Gudni A. Emilsson as we celebrate the season! The Thailand Phil concludes a season of memorable performances with a rousing interpretation of one of classical music’s true gems: Carl Orff’s Carmina Burana. The end of season is a time for celebration and the orchestra has invited many international friends to the party: American violist Pamela Ryan, Thai sporano Pijarin Wiriyasakdakul, German countertenor Arno Argos Raunig, and Italian bass Maurizio Leoni. Honorary Founding Chief Conductor Gudni Emilsson brings a diverse program of excellent music to the acoustically vibrant Prince Mahidol Hall. Carl Orff’s monumental yet down-to-earth cantata, Carmina Burana, is one of the most popular pieces of the classical music repertoire. Its heart-pounding opening movement, “O Fortuna”, has been made instantly recognizable by movies, commercials, and sporting events. About the work Orff wrote: “my concern is not with musical but with spiritual expression” and tried to show the full scope of human experience: life and death, beauty and ugliness, fortune and despair, love and hatred. The text and music effortlessly blend exuberance with introspective tranquility. 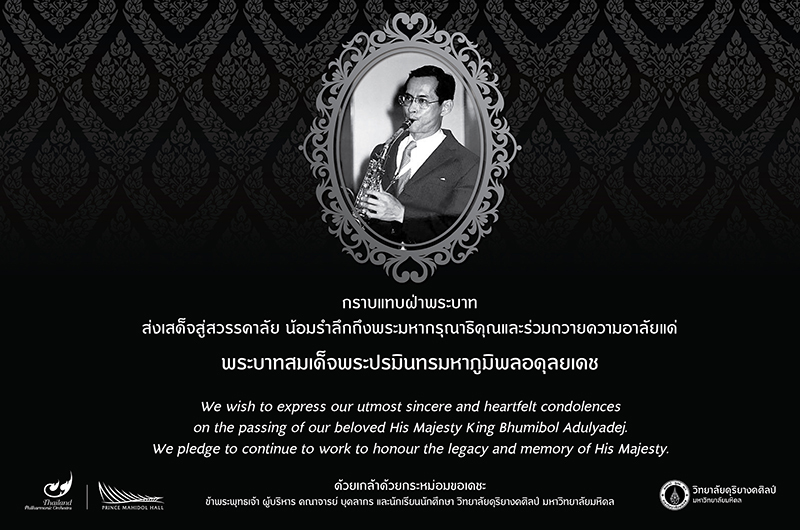 The Mahidol Chorus and chorus master Rit Subsomboon join the orchestra for this very special performance. According to the composer Alan Schulman, his Theme and Variations were sketched on a subway ride from Brooklyn to Manhattan in 1940. Its neoclassical textures and virtuosic passages make it a perfect fit for one of America’s most respected violists, Pamela Ryan. Before it all, the Thailand Phil performs one of the great Romantic works of all time: the Prelude and Liebestod from Richard Wagner’s music drama Tristan and Isolde. Join the celebration and help bring the orchestra’s 13th Season to a close on September 21 at 7 PM and September 22 at 4 PM in Salaya’s Prince Mahidol Hall.